Coal fires, solid fuel fires and wood burning fireplaces are an economical and pleasing way to heat your home. An open fire set in a contemporary, traditional, or classical fireplace can be the heart of your home and the feature that’s most expressive of your personality or design taste. 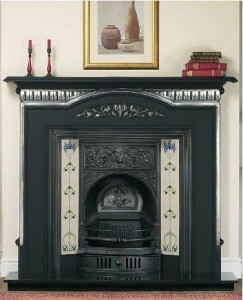 World of Stoves supplies solid fuel and log burning fires and fireplaces to suit any decor and home heating needs. We carry a large number of brochures you can look through to get ideas. Deciding whether to have a wall mounted fire or a hearth mounted fire depends on a number of factors: fuel availability, heating needs, space, convenience and budget to name just a few. This type of fire is becoming more and more popular due to the fact they are an excellent, affordable and fuel efficient way to use an existing fireplace and for their relative ease of fitting. 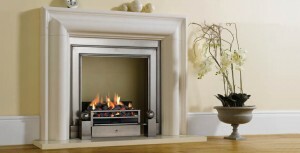 We supply gas fireplace inserts and gas hole-in the wall fireplaces from the following manufacturers. We supply fireplaces and fireplace suites in many beautiful styles from a wide range of suppliers who deliver excellent products manufactured and constructed to the highest standards. Fire surrounds are the focal point of your room and can set the tone for a formal or informal space. 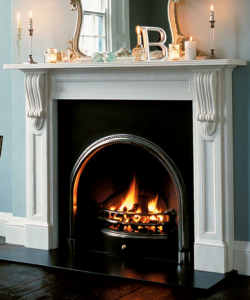 For an existing design scheme of a room, a fireplace surround can be chosen to suit the decor. Fireplace surrounds that come complete with the fire are known as fireplace suites. You may fancy stainless steel, a marble fireplace, a wood fireplace surround or a limestone fireplace to match your home style, or a cast iron reproduction fireplace if you need a period look to your room. World of Stoves can supply and install the fire, the surround, the mantel and the hearth as separate components of your choice or as a suite selected from a manufacturer’s range of products. We have many open fires, wood fires and stove fires under fire for you to see. Visit our fireplace showroom to see how certain materials look and behave in reality and discuss how we can meet your needs with a custom or bespoke fire surround and fireplace solution. Fires – Gas fires, electric fires, inset fires, solid fuel fires, log burning fires, cast iron fires – you name it, we can supply and install it. 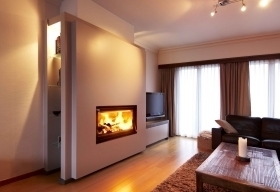 It is really important to have a fireplace survey done for the fireplace you choose. Avoid bad news at installation time. A World of Stoves representative will give you a free survey and quote, so that you know the fireplace you choose is appropriate for the job. In any case, a registered professional must be involved in your fireplace installation if you don’t choose the fireplace retailers where you purchased your stove.